Josh Gillies shows off his new South Shields colours. South Shields have raided Darlington for the fourth time this summer after completing the signing of forward Josh Gillies. 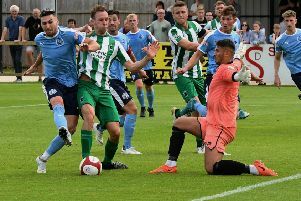 The 28-year-old, who can play on either flank or behind a main striker, joins former Darlo team-mates Gary Brown, Chris Hunter and Phil Turnbull at Mariners Park. The former Gateshead and Carlisle United player has told of his excitement after being convinced to make the switch by Shields joint managers Graham Fenton and Lee Picton. Gillies said: “I’m over the moon to have joined the club. “I met Graham and Lee earlier this week and came away feeling very excited about what is happening here. “From the outside looking in, you can see where the club is going and where it wants to be. Gillies started his career with Sunderland Nissan and Newcastle Blue Star before progressing up the pyramid, including a two-year spell in the Football League with Carlisle. He joined Darlington from Gateshead in 2016, and has twice appeared for England’s C team. 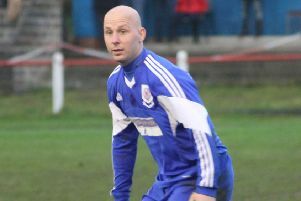 Gillies is now hoping to help Shields achieve further success after they won promotion in each of the last three seasons. He added: “You want to join a team that is looking to win the league, and that’s the number one target. “I’m confident we’ve got the team here to do that. “I know quite a lot of the squad having played with them in the past, so it will be easier than going to a brand-new club where you don’t know any of the players. “Everything I’ve heard about the place is positive. Gillies was part of the Darlington team beaten 3-0 by the Mariners in the FA Cup last season. Although his personal experience that day was a negative one, he went away feeling impressed with Shields’ style of play. He said: “We got a bit of a roasting that day and Shields played well. “The way they play caught my eye as soon as I saw them. “The full-backs spread and they like to get it down and play, which is how football should be played. “I like to play on the floor and get into space to hurt defences. Shields joint manager Graham Fenton said: “We’re delighted to bring Josh to the club as our latest addition. “He’s someone we showed a bit of interest in last season and it’s great to now have him on board. “Josh will give us real quality at the top end of the pitch.